5.7x28mm ammunition is deeply connected with the development of military PDWs (personal defense weapons) such as the FN P90 for which it was designed. It is a high velocity cartridge primarily used by citizen gun owners in the FN Five-Seven pistol. While military variants of 5.7mm ammunition are designed to defeat body armor, commercial ammo that you'll find for sale today is constructed for target shooting or (in the case of hollow point versions) self-defense against unarmored assailants. 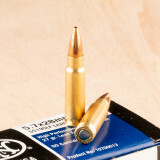 5.7x28mm ammunition fires a very light bullet weighing about 40 grains. As a result, the cartridge's muzzle velocity clocks in at about 2,350 feet per second. The number of manufacturers producing ammo for this caliber is relatively small. FN produces a load using Hornady V-MAX bullets suitable for varmint hunting or self-defense, while Federal's American Eagle TMJ load is the most cost-effective choice for target shooting. 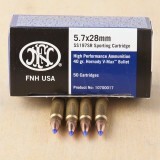 This 5.7x28mm ammunition from the US division of FN (maker of the Five-Seven pistol and PS90) features the Hornady V-MAX hollow point bullet, a polymer-tipped fragmenting design suitable for varmint hunting. Each round in this bulk priced case of 2,000 fires a 40 grain version of the V-MAX at 2,034 feet per second, producing excellent medium-range accuracy. These cartridge use non-corrosive primers and brass cases. FN Herstal is one of the most renowned names in the firearms and ammo business. 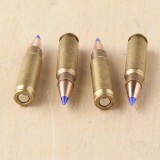 The 5.7x28mm cartridge is an original FN design originally developed for use in personal defense weapons (PDWs); however, it has also found some popularity in the sporting world as well. This is a great round for home defense, varmint hunting. 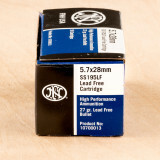 From FN Herstal, this 5.7x28mm ammunition is New with a Jacketed Hollow-Point (JHP) 27 Grain bullet. 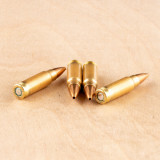 You'll get 50 rounds of Brass cased ammo that's ready for your next trip out to shoot. Like every round for sale, we stand behind this ammo and have your back so rest assured you're not only getting a good deal, you're getting the peace of mind that comes along with a trusted supplier. 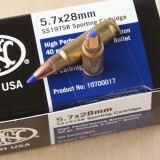 These 5.7x28 cartridges use a 50-grain V-MAX bullet, which is useful for many different purposes. The round is very effective in autoloading handguns, allowing you to get the target practice you need without frustration and at a reasonable cost. In this load, the V-Max bullet is a polymer-tipped projectile that assists in accuracy, provides expansion and contributes to a reduced risk of ricochet. 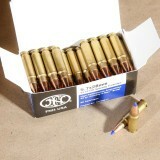 In this package, you'll get a single box of 50 rounds ready to fire. FN Herstal is one of the best names in ammunition, especially for tactical and military-grade products. The not only have some of the finest ammunition available, they also conduct barrel manufacturing and machining. This company designs, develops, manufactures, and tests some of the finest law enforcement and military products available. The 5.7x28mm is a high-quality handgun round that is used for a large variety of purposes, including self-defense and target shooting. It has excellent speed and performance, giving gun owners reliable velocity and energy. 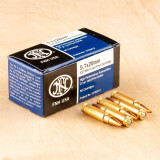 If you need top-quality ammo for your 5.7x28mm handgun, order a few of these 50-round boxes. 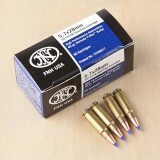 You’ll have the ammo you need for varmint hunting, self defense, or range shooting.